We've got another floral card this week - CAS and lots of white space, and with a big punch of drama from bold colours and shaded images. IMPORTANT: Before you create and submit your card please read the Member Rules page. The InLinkz will close and voting will begin at 12 noon EST on Saturday. Please don't forget to come back and vote for 3 of your fellow member's submissions. Voting ends on Sunday at 12 noon EST. The results of voting will be announced at 8:59 a.m. EST and our new challenge will begin at 9:00 a.m. EST on Monday. If you missed the voting results for last week's challenge, please scroll down to the previous post. Gorgeous card....love the Purple....my favorite! Just gorgeous!Love the colours and the raised middle flower! This is just stunning! Will be hard not to just copy what Marion did! Loved the Inspiration MUSE this week and couldn't wait to play along! 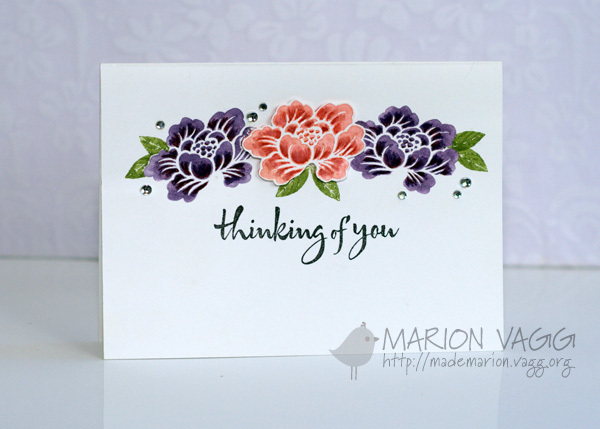 Thanks so much......I too used a very old Stampin Up set that someone gave me! !